Making Change at Walmart (MCAW) held a press conference in Milwaukee on April 12 to draw attention to the “dark store” tax loophole used by Walmart and other big box retailers. MCAW also called on Wisconsin state leadership to revisit A.B. 386, a bill that attempts to close this tax loophole. Alderwoman Chantia Lewis (District 9), representatives from Black Leaders Organizing for Communities, and members of UFCW Local 1473 also attended the event, which was held at a vacant mall. Big box retailers like Walmart have been using the “dark store” tax loophole to reduce their property tax rates by assessing their properties as if they were vacant, abandoned, or “dark.” This tax loophole unfairly shifts the property tax burden to homeowners and reduces the amount of funding available for public schools. 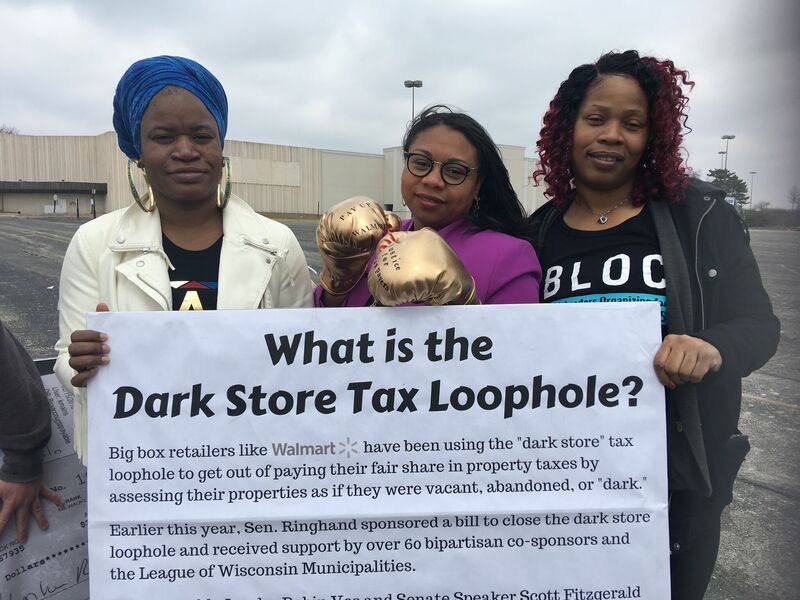 In Wisconsin, Walmart and other big box retailers used the “dark store” tax loophole to try and cut their property assessments by an estimated $700 million for the 12 months ending November 2017. MCAW will host a similar event press conference at the Wisconsin State Capitol on Tax Day, Tuesday, April 17 with the sponsor of A.B. 386, Wisconsin Senator Janis Ringhand, as well as Senator Chris Larson and Assemblymember John Ohnstad.